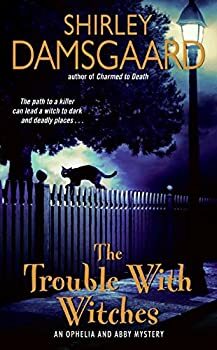 Shirley Damsgaard resides with her family in small-town Iowa, where she has served as Postmaster for the last twenty years and writes urban fantasy in her free time. Here’s Shirley Damsgaard’s website. Ophelia And Abby — (2005-2009) Publisher: Bewitched meets Murder She Wrote in this delightful new cozy mystery series featuring Ophelia Jensen, small town librarian and reluctant psychic, and her grandmother Abby, a benevolent witch. Thirty something Ophelia Jensen wants to live a quiet life as a small town librarian. She’s created a comfortable existence with her kooky, colorful grandmother Abby, and if it were up to her, they could live out their days — along with Ophelia’s dog Lady and cat Queenie — in peace and quiet. But, to Ophelia’s dismay, she and Abby aren’t a typical grandmother/granddaughter duo. She possesses psychic powers, and Abby is a kindly witch. And while Ophelia would do anything to dismiss her gift — harboring terrible guilt after her best friend was killed and she was unable to stop it — threatening events keep popping up, forcing her to tap into her powers of intuition. To make matters worse, a strange — yet devastatingly attractive — man is hanging around Ophelia’s library, and no matter how many times she tells him she’s sworn off men forever, he persists. Soon this handsome newcomer reveals he’s following a lead on a local drug ring, and then a dead body shows up right in Abby’s backyard. And much as Ophelia would like to put away her spells forever, she and Abby must use their special powers to keep themselves, and others, out of harm’s way. I like mysteries, and I like fantasy, and so I'm always in the market for a mystery with fantasy elements! 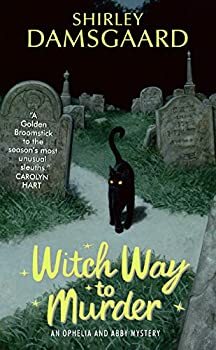 Shirley Damsgaard's Witch Way to Murder is a cute, fun addition to this hybrid subgenre. It has a few flaws, but I liked it enough that I plan to read the next Ophelia and Abby novel as soon as I get my hands on it. Witch Way to Murder is set in the small town of Summerset, Iowa. Damsgaard sets a great scene; The town, the weather, and the people all feel "real." After reading Witch Way to Murder, I found myself craving another Ophelia and Abby mystery and went to the library for my "fix." They didn't have book two, Charmed to Death, but they did have book three, The Trouble With Witches. I decided, what the heck, you can usually read these cozy mystery series out of order anyway. Often, authors will only allude vaguely to events of previous books in case you're reading them out of sequence. In The Seventh Witch (2010), Ophelia and Abby travel to the Appalachians to visit family, and learn that events of decades ago continue to echo through the present. Along the way, Ophelia learns a lot about herself and the future she wants to build. 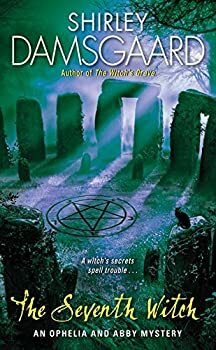 Unlike previous Ophelia and Abby books, The Seventh Witch is not primarily focused on the “whodunit” aspect. There’s a murder, but the question is not so much who committed the crime but how and why. The question of “how” comes about because there are no obvious signs of foul play, leading Ophelia to wonder whether curses might be more powerful than she realized. Investigating “why” opens up a Pandora’s Box of secrets from the past. Ophelia must discover the truth behind a rift within the family and a feud between her family and another.